With this magnet paper u can see the magnetic field just by putting it on the magnetic material. ..
With this Magnetic Green Viewing Paper / Magnetic field viewing film u can see the magn.. The FH 52 is a handheld measuring instrument for measuring the magnetic field strength H .. 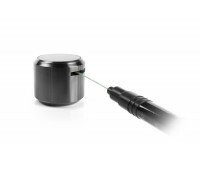 The magnetic field strength meter FH 55 is a compact precision instrument that measures the magne..
Units: This tool measures in mT (millitesla) only! The relation between "mT" (millit..
An easy tool which identify south/nord -pole for you. The green light means southpole while a red.. Magnetic Shielding Chambers are used to shield magnetic sensors from ambient magnetic fields. Mai..